Of the eastern and central U.S. states studied so far, Oklahoma is by far the worst-hit in recent years. Texas, Kansas, Colorado, New Mexico and Ohio all have had more earthquakes in the past year. View larger. | Blue dots 1960-2012. Green dots 2013. Red dots 2014. Note that an older methodology was used to count earthquakes from 1960-2012. Map via USGS. Earthquake activity has sharply increased since 2009 in the central and eastern United States. The increase has been linked to industrial operations that dispose of wastewater by injecting it into deep wells. This practice occurs in hydraulic fracturing – or fracking – which is the forcing open of fissures in subterranean rocks by introducing liquids (water, sand, chemicals) at high pressure. The process is used in oil and gas extraction. 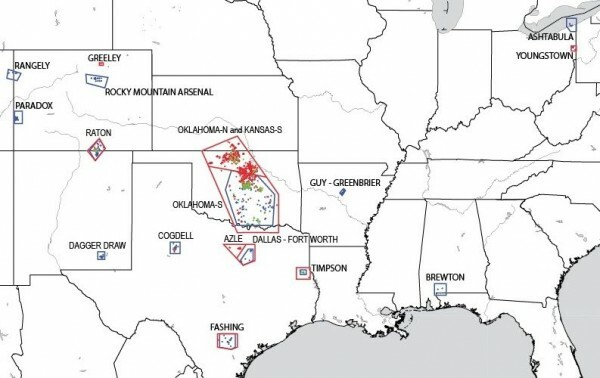 USGS scientists identified 17 areas within eight states with increased rates of what it called induced seismicity. Since 2000, several of these areas have experienced high levels of seismicity, with substantial increases since 2009 that continue today. The report shows that – of the eastern and central U.S. states studied so far – Oklahoma is by far the worst-hit state in recent years. Last year, the report said, Oklahoma had more earthquakes magnitude 3 or higher than California. The trend for this state in recent years has been upward. 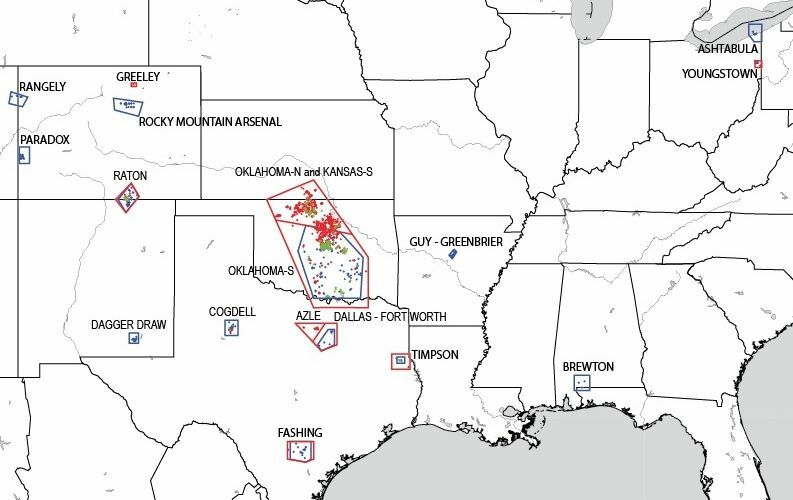 Seismic activity in Texas near the Dallas-Fort Worth area has also increased substantially recently. Kansas, Colorado, New Mexico and Ohio have all experienced more frequent quakes in the last year. … located near deep fluid injection wells or other industrial activities capable of inducing earthquakes. This data animation by the U.S. Geological Survey (public domain) shows the extraordinary increase in earthquakes (low to moderate intensity, 3.0 and higher) in the Oklahoma in areas where hydraulic fracturing for gas and oil has greatly increased. The rate has gone from an average of 1.5 a year to 2.5 a day! These earthquakes are occurring at a higher rate than ever before, and pose a much greater risk and threat to people living nearby. These preliminary models should be considered experimental in nature and should not be used for decision-making. This is the first comprehensive assessment of the hazard levels associated with induced or “man-made” earthquakes in these areas. Read the report – called Incorporating Induced Seismicity in the 2014 United States National Seismic Hazard Model—Results of 2014 Workshop and Sensitivity Studies. Bottom line: A new report from USGS – released April 23, 2015 – shows that earthquake activity in the central and eastern U.S. has sharply increased since 2009. The increase has been linked to industrial operations that dispose of wastewater by injecting it into deep wells.